Hygiene is very important when you have a baby. You need to make sure that they are clean and smell good so that they are presentable and would not catch any sickness. It is through this that you are able to show how you love your child. I personally see it as a necessity to always make sure that I regularly bathe my child. However, I know how difficult it is to do that because the water can sprinkle all over and there is the risk of your baby slipping off. But thankfully, I have discovered how effective these baby tubs are. 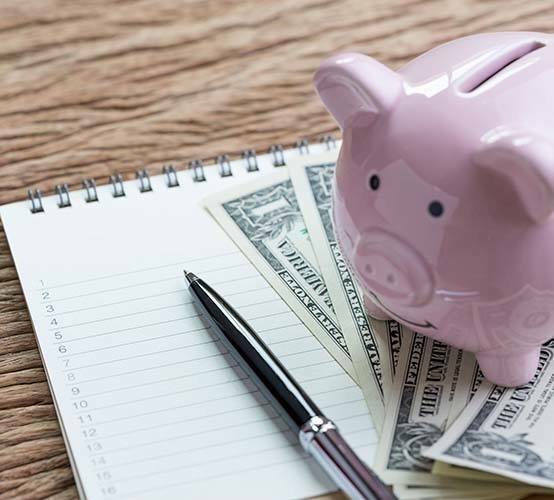 In this article, I'm going to share with you the benefits of having one. 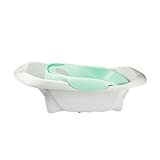 We will also help you choose the best baby tub that will surely make it easier for you to bathe and wash your baby in an enjoyable and safer manner. Why Do You Need a Baby Tub? There are a lot of benefits you can get out of using a baby tub. However, the best benefit is that it makes bathing your baby easier for you. That is the main purpose why baby tub are made in the first place. It’s in having a baby tub that you no longer have to worry about your baby slipping off or where you’re going to put them when washing. Another important thing why you need to have a baby tub is because it also makes washing your baby safer for the both of you. Well, it’s because these tubs are designed to ensure the safety and security or your baby. Most baby tubs have a non-slip surface, while there are also those that have safety barriers that secure your baby from sliding off of it. There are also some that have safety straps or harnesses that locks your baby into place when washing them. These baby tubs make life easier for you because it makes bathing and washing a more comfortable experience for you and your baby. Your baby will feel more comfortable with it because most baby tub surfaces are coated with soft padding cushion. The shape is also designed in a way that it ergonomically supports the back structure of your baby. What happens when you find it comfortable and easy to wash your baby? You are most likely to wash them more frequently and results in better hygiene because your baby is always clean – free of stains, unpleasant order, and far from bacterial and parasitic infections. When you're choosing a baby tub, the first thing you need to ask yourself is if your baby can fit inside it. Know the size of your baby and make sure that it will correspond to the size of the baby tub. It would also be better if it would be bigger than your baby, but not too much so that they will have space to move their limbs in different directions. Also, think about how the washing process will go on. Your hands should find it easy to move so that you won't have any problem in rubbing soap on your baby's body later on. It's not all about the functionality of a product that you'll check when choosing one. You also need to look at its aesthetic features. Does it look good? Will your baby like it and be enticed to spending time on it? Will it fit the look of your bathroom? It's in asking questions like this that you can choose the perfect baby tub for you and your baby. The durability is another important thing to factor in when choosing a baby tub. It's through this that you can know if your chosen baby tub will be usable in the long run. By knowing the materials it is made of and knowing more about the brand, you are also getting a glimpse of how long of a service life will it have. You surely don’t want to spend a lot of money buying another one just because your current baby tub is damaged. You want something that will last, something that you can use for your next baby and succeeding ones. Then there comes the baby tub's price. Remember that you don't need to spend a lot of money just to get a high-quality tub. There are a lot of affordable and cheap tubs sold in the market that have the similar quality with that of the more expensive ones. It's all just a matter of being wise and knowing which features and materials are worth having in a baby tub. 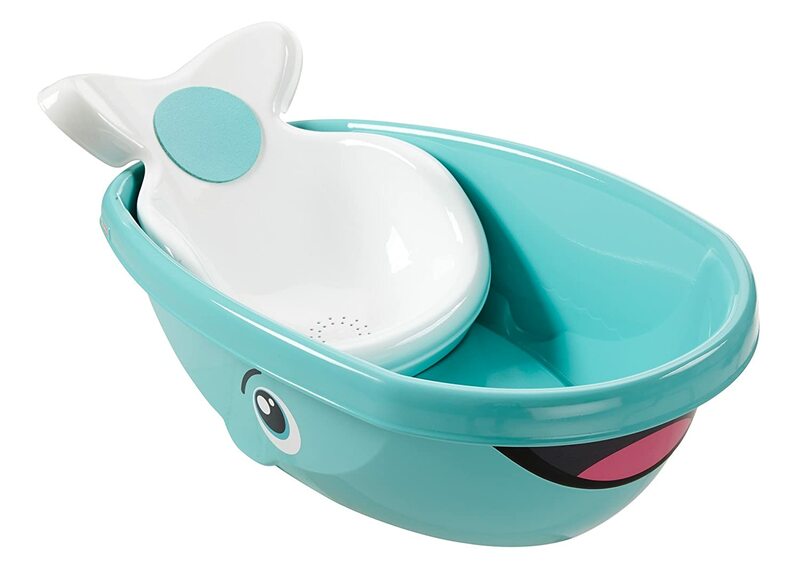 Fisher-Price Whale of a Tub Bathtub is specifically designed for infants because of its size, design, and shape. It has a soft-foam face cushion where your baby can place his face on when they’re turned on their belly. This gives them maximum comfort and safety. It also features a baby stopper insert that prevents slippages on your baby. It makes sure that your baby won’t slide or fall off of it because of the surface’s pattern texture. It’s pretty good at holding them. 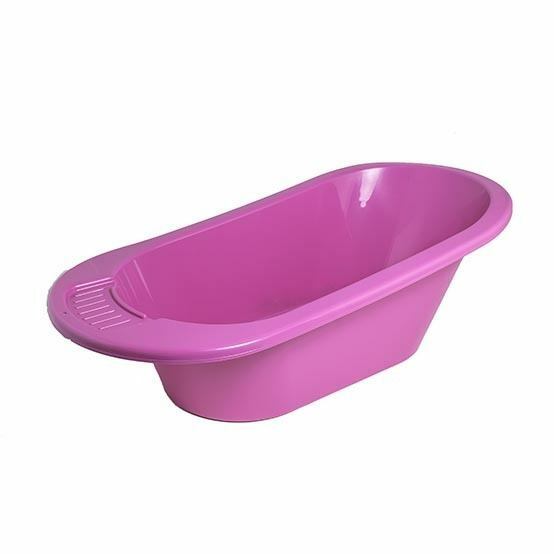 What’s nice about this baby tub is that it can also be used by toddlers because the insert can be removed. This can give your baby a lot of space for them to freely sit and play. It also includes a baby whale cup that you can use to pour water on them. This can also serve as a toy. Supporting your baby because of its surface’s pattern texture. The removable center insert is safety for newborn and simply remove it when your baby grows up. The soft-face cushion is very useful. The stopper for the outlet is a bit sharp and course if your baby makes contact with it, they’re likely to get a scratch. Your baby will most likely slouch if they slide to its bottom portion. The Munchkin White Hot Inflatable Duck Tub is a padded baby tub that your baby will surely love. It looks very enticing to all babies because of its design, having been shaped as a yellow-rubber ducky. It features a disk that notifies you if the water is already too hot, as the disk turns white. This is what you need if you are always on-the-go and you need to bring a tub for your baby. Remember, this one is inflatable, so you’ve got plenty of room to store this tub. The bottom surface of this tub is textured in a way that ensures your baby won’t slip or slide on it. This is ideal for babies who are 6 to 24 months old. 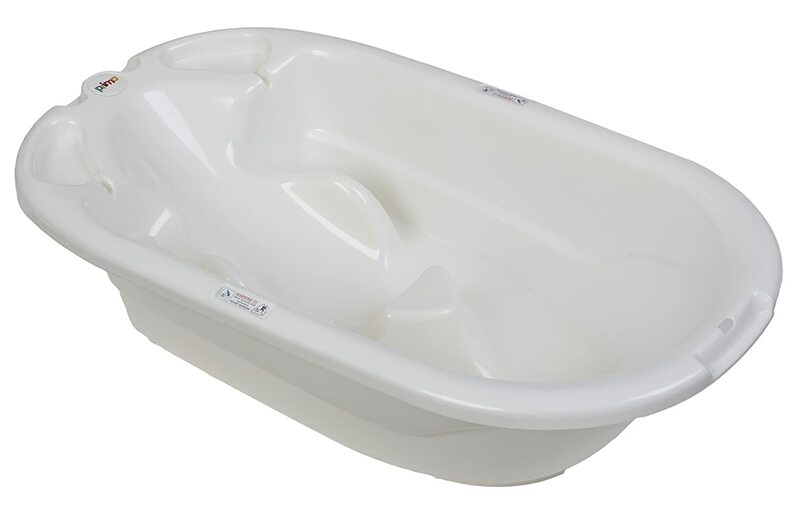 So if you’re baby falls to that age category, then it’s a good sign that this “duck” tub is what you’re searching for. 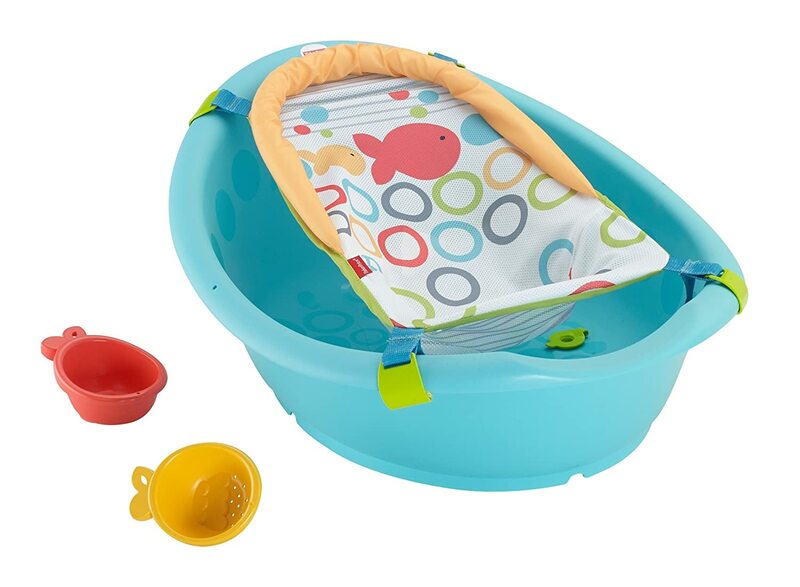 The size of this baby tub is perfect for your baby because it’s not too big or too small. It looks very cute! 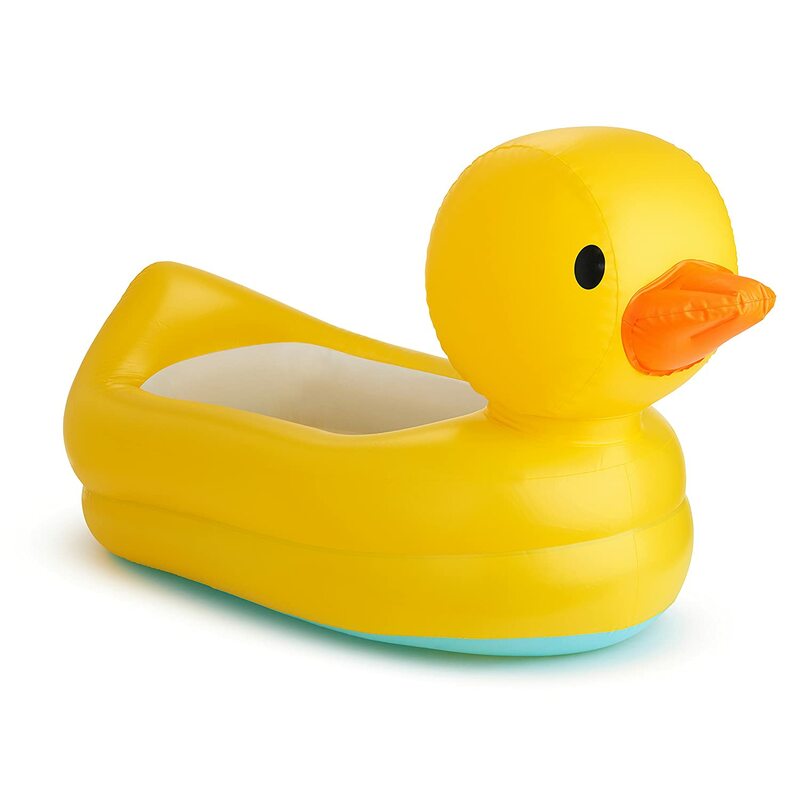 The rubber ducky design will surely make your baby love this tub. Apart from that, the bright yellow color is also very enticing. It’s soft and has a smooth surface. This isn’t recommended for newly born babies. This is for 6-months-old to two-year-old babies. It’s not the best when it comes to the longevity of its service life. A single tear or pop can make this gorgeous tub useless. 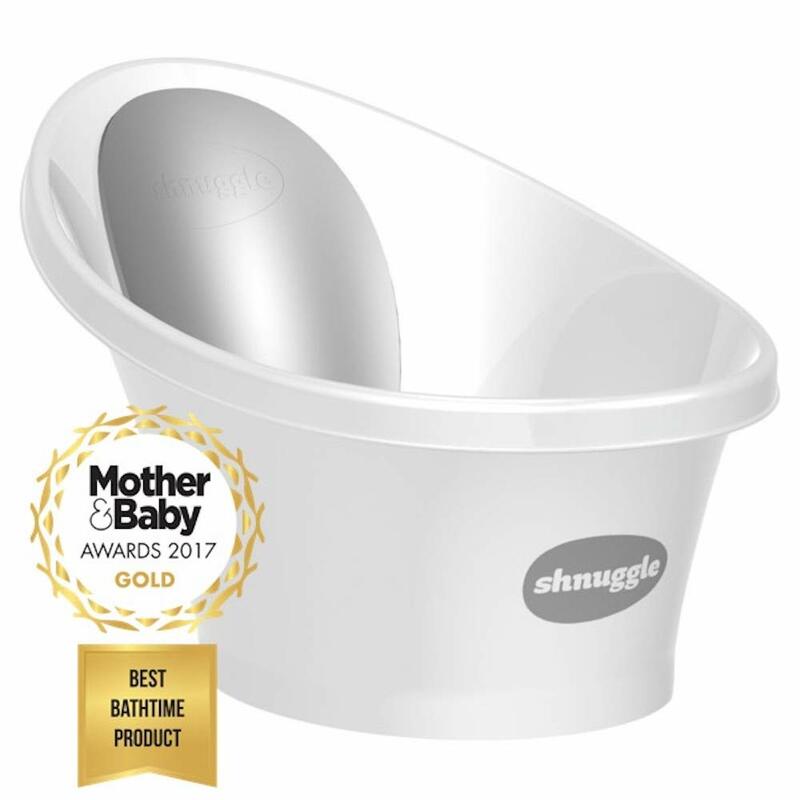 The Shnuggle Baby Bath Tub is another highly recommended product on our list because of its depth. It’s a deep baby tub that’ll surely wash off any dirt from your baby. It weighs 2.6 pounds which are lighter than most baby tubs and measures 23.6 x 15 x 10.2 inches. It features an elegant smooth curved design that perfectly matches its top that’s slowing down. This can be used by babies from 0 to 12 months old. A large backrest that is made from warm foam can be found on its side. Meanwhile, you can find a firm grip non-slip padding on its bottom. This assures that your baby won’t accidentally slide off it. It offers great support because of its deep design and curved edges. 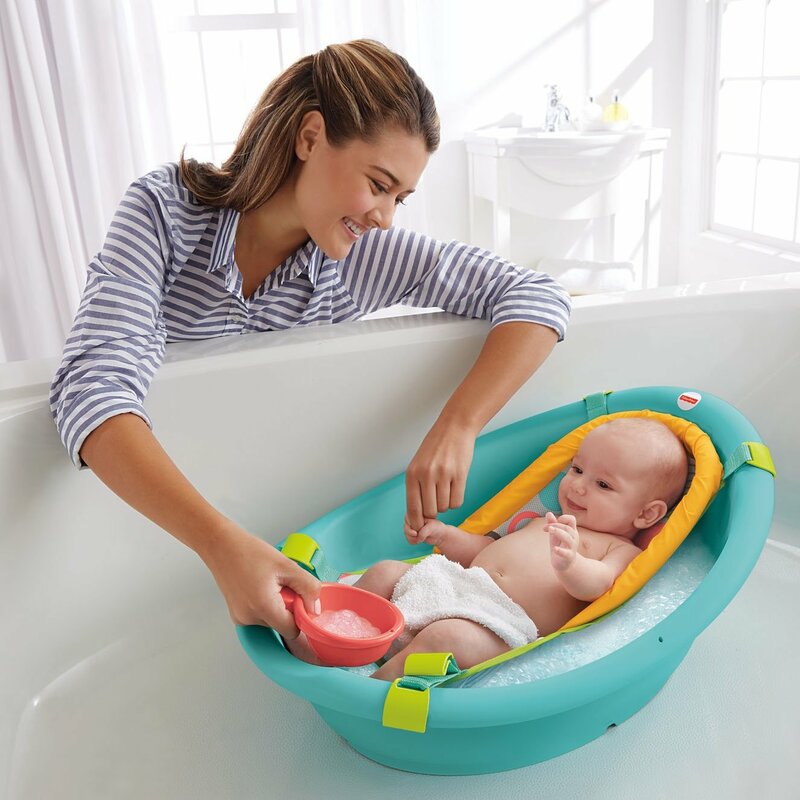 There is lots of space for your baby to move when bathing. It’s very sturdy thanks to its simple and solid body construction. There is no drainage hole where the dirty water can flow out off of it. The design is too simple. It would be better if there are extra features that can add to the product’s safety. Then there’s the PRIMO EuroBath that can be used by a lot of babies as it is ideal for babies aged 0 to 2 years old. It is ergonomically designed to make it perfectly shaped for your baby’s body. There are even safety supports that accommodate your baby’s forearms and legs. It’s because of these features that this baby tub is a very popular option for parents. Aside from that, this baby tub is also very easy to use. It is made of a clean and high quality plastic construction. There are also storage areas on the side top portion where you can put the soap on while you’re washing them. It’s made in the U.S., and is assured to be free of lead, BPA, and phthalate. 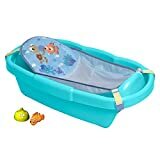 This is a huge baby tub, your baby can even play inside it while you’re washing them. It’s very durable and feels very sturdy. You can use this for years to come. It is ergonomically shaped that your baby will perfectly fit inside it. Though the product says that it can be used by babies who are 0 to 2 years old, this isn’t recommended for small babies. This is because they can slip off of it and they can hurt their limbs because the space for their arms and legs are still too big. The Fisher-Price Rinse'n Grow Tub is another highly recommended product in our list. This is a bathtub that has three stages. It can be assembled to fit the three stages. The first stage is for newborn babies who are up to 3-months-old. Then the second stage is for babies 3 months to 6-months-old. The third stage is for toddlers. It is completely machine washable. This tub has a sling that is for the Stage 1 and Stage 2 babies. And if you’re going baby eventually grows, you can then remove the sling and turn it into a tub for your toddler. It weighs 3.2 pounds and measures 18.5 x 25.4 x 9.8 inches. It’s easy to clean with a damp cloth to remove stains and dirt from it. The drain is small, which is a good thing because your baby won’t be able to accidentally plug their toe in it. The design is great. It’s appealing and visually attractive, especially with the sling hanging on it. Its sling is a little bit flimsy. Though it’s safe, it still feels a little bit insecure because it’s only supported by straps on its sides. It has an egg shape design which is a bit unorthodox. Your baby might have a hard time in fitting themselves in when they grow bigger. The five reviewed products are all highly recommended ones. However, we can’t deny the fact that one of them will stand out above the rest. And that baby tub is the PRIMO EuroBath. It has an ergonomic design which makes your baby feel comfortable lying on it. 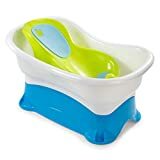 It can also secure your baby’s legs and feet pretty well while they can comfortable put their arms on the sides of the tub. It has a soft surface that makes sure your baby won’t slide off it. 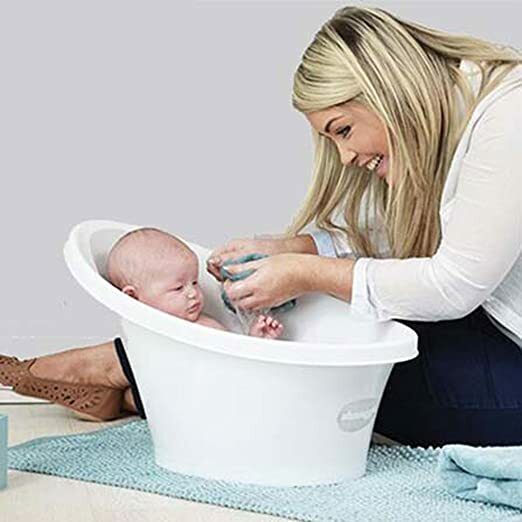 If you want to make it easier for you to wash your baby, then this is the baby tub you need to get.